Love the RSC, but not BP? Everyone should have access to the arts, especially young people. 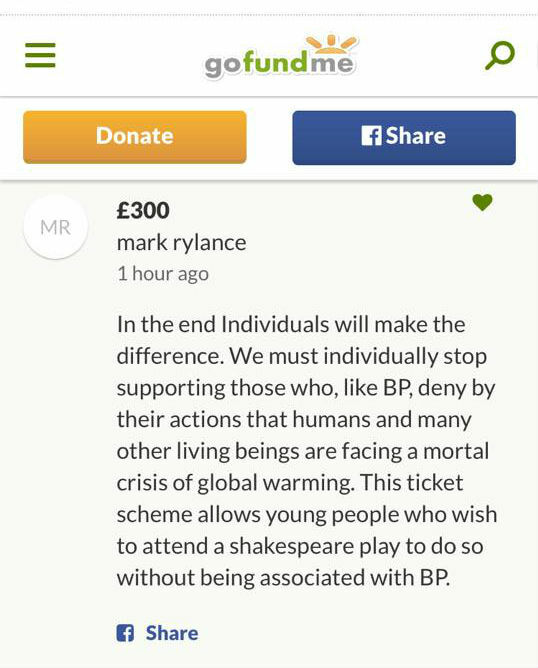 But the RSC's £5 tickets for 16-25 year olds are currently sponsored by BP - an oil company that is endangering those same young people's futures. With your help, we will create an alternative scheme that gives young people oil-free affordable access to RSC plays - and shows that there are ethical alternatives to oil sponsorship. The RSC is one of Britain's most beloved theatre companies. But its reputation is being tarnished by its choice of BP as a sponsor. BP's global extraction of fossil fuels is causing dangerous climate change and deadly oil spills while supporting repressive regimes and blocking clean energy alternatives around the world. Affordable tickets for young people are vital - otherwise they are priced out of experiencing the RSC's powerful productions. But it is unfair that 16-25-year olds can only access the art they love by helping to promote a company that is actively threatening their futures. BP only provides around 0.5% of the RSC's annual income, and there are many positive alternatives to oil sponsorship. Last year, both Tate and the Edinburgh International Festival parted company with BP after decades-long relationships, and hundreds of artists have pledged not to take oil money for their work. 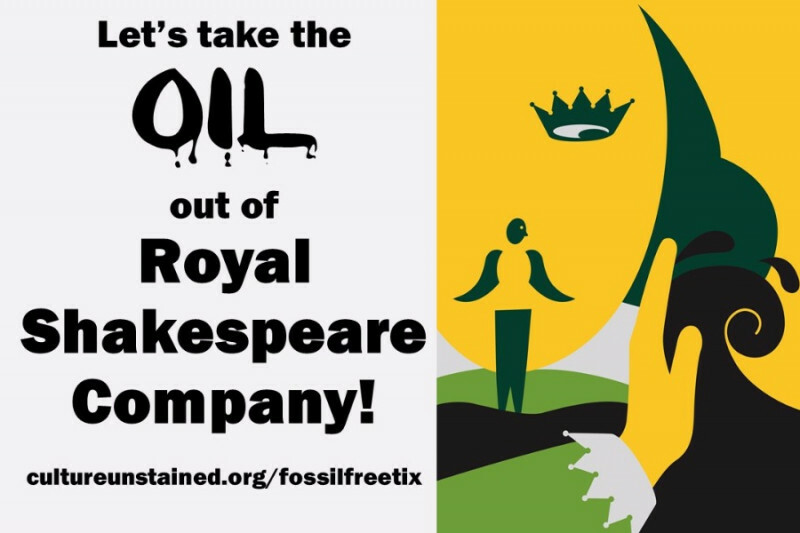 So we will show the RSC just how much its artists and audiences want an end to oil sponsorship, by crowdfunding our own unofficial 'Fossil Free £5 Tickets' scheme. Who is behind Fossil Free £5 Tickets? This brand new scheme is supported by 16-25-year-olds, including existing members of the RSC's 'BP £5 Tickets' scheme, young actors, students and climate campaigners. It is also supported by a number of theatre professionals, many of whom have worked with the RSC in the past. They include Mark Rylance (who is an RSC Associate Artist), Emma Thompson, Vanessa Redgrave, Andrew Garfield, Tamsin Greig, Vivienne Westwood, Caryl Churchill, Kristin Scott Thomas, Maxine Peake, Simon McBurney, Miriam Margolyes, Zoë Wanamaker, Phyllida Lloyd, Jasper Britton (also an RSC Associate Artist), Margot Leicester and Moira Buffini, Timberlake Wertenbaker, April de Angelis, Sam Pritchard, Anders Lustgarten, Julia Pascal, Kirsty Housley, Natalia Kaliada, Daniel Bye, Cressida Brown, Lucy Ellinson, Francesca Martinez, Trevor White, Eleanor Matsuura and Shelley Hastings. The scheme is being co-ordinated by Culture Unstained, a campaigning organisation working towards ending oil sponsorship, in partnership with culture professionals and communities on the frontlines of oil extraction. We are members of the Art Not Oil coalition. How will Fossil Free £5 Tickets work? We will buy tickets to RSC plays and offer them to 16 to 25-year-olds for a donation of £5 - the money from this crowdfunder will cover the rest. The more funds we raise, the more tickets we will be able to offer. Sign up to our mailing list to get hold of tickets. We also intend to reach out to young people from marginalised and disadvantaged communities, who would never normally go and see a play at the RSC. We will encourage them to join the scheme, and support them to make it possible – including covering transport costs – because we are committed to making culture accessible to all, not just privileged elites. Anything you are able to give - from £10 to £100, or even more! - will be put to good use supporting young people's access to amazing theatre. And 10% of whatever you give will support the inspirational work of communities on the frontlines of BP's fossil fuel extraction. The more we raise, the clearer the message we will be sending to the RSC that people are so strongly opposed to oil sponsorship that they are prepared to put their own money where their mouths are. How is it supporting frontline struggles against BP? BP is one of the world's largest oil companies, operating in 72 countries. · It makes billions every year by extracting fossil fuels, making it the world's 11th biggest corporate contributor to climate change . It has no plans to stop searching for new sources of oil and gas, despite the need to leave 80% of known fossil fuels in the ground. · It was responsible for the world's worst oil spill in the Gulf of Mexico in 2010, which killed 11 workers, poisoned countless marine animals and birds, and impacted the health and livelihoods of communities all along the US and Mexican Gulf Coast. · It works in close partnership with many of the world's most repressive regimes - including Azerbaijan, Indonesia and Egypt - and can push ahead with projects safe in the knowledge that local opposition will be suppressed . A deeply inspiring community media project that is lifting up the voices of US Gulf Coast communities working towards justice and sustainability. The region is still reeling from the effects of BP's catastrophic Deepwater Horizon spill, whilst being targeted for huge new oil extraction and pipeline projects and buffeted by extreme weather exacerbated by climate change. 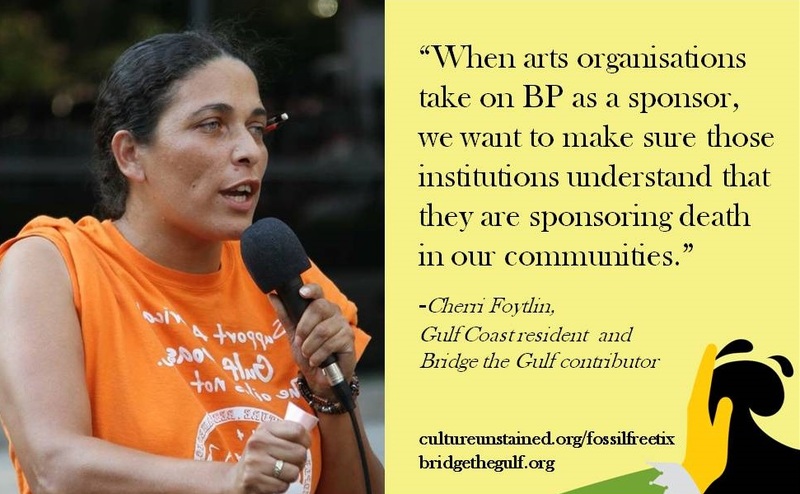 Bridge The Gulf provides training, support, and resources to amplify the voices of those on the frontlines of struggles for survival and for progressive movement-building in the region. Free West Papua tirelessly campaigns for self-determination for the West Papuan people after decades of brutal occupation by the Indonesian government. BP is one of the biggest investors in the resource-rich region and has worked closely with the Indonesian government to develop a huge gas project. 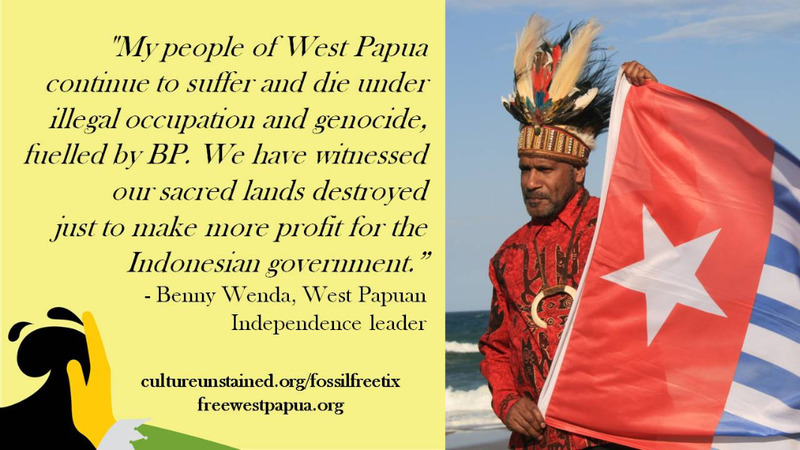 Indigenous West Papuan communities are calling for a boycott of BP because of its support for and financial contributions to the regime that is violently oppressing them. We want to show the RSC the strength of feeling from its own community – of artists, audiences and young theatre lovers – against BP sponsorship, whilst demonstrating positive alternatives and supporting those who are at the sharp end of BP's operations around the world. We hope that the RSC will acknowledge the depth and breadth of concern and end the sponsorship deal with BP as soon as possible, without putting any jobs at risk. A £10 donation will get you our eternal thanks and appreciation. A £20 donation will get you a thankyou tweet! For a £1000 donation you will be invited to an exclusive outing to see a play at the RSC with the team behind the £5 Fossil Free Tickets scheme! These rewards are optional, and we will get in touch to see if you would like to receive them after you have donated. Thanks once again for your amazing donation to Fossil Free £5 Tickets. Together we are genuinely creating a positive alternative to oil sponsorship! - We raised over £2500 from about 60 people in the first week - a quarter of our target, and evidence that this idea is a popular one! Some big names from the theatre world donated, including Mark Rylance, Emma Thompson, Caryl Churchill and Jasper Britton. Many thanks to ALL of you. - The first Fossil Free Tickets have been ordered by over 25 young people so far, all of whom are using them to see The Earthworks/Myth double-bill at the RSC. Watch our new film featuring Myth director Kirsty Housley who supports our scheme. Help us spread the word on social media too, by liking us on Facebook: facebook.com/FossilFreeTix , following us on Twitter: @fossilfreetix and sharing! Thanks so much for your support. We've heard that there is now a huge debate going on inside the RSC about BP sponsorship, so let's make sure we keep up the pressure for oil-free theatre. We've raised over £1200 in the first two days! Thank you all SO much for your support. Now we need to get the word out. We don't have the marketing power of the RSC or BP. But we do have you! So please share this with anyone who you think might either donate or want to be part of the Fossil Free £5 Ticket scheme. Thanks once again for your support, especially at a time when there is so much else going on in the world!